Want to sharpen your tennis game this summer? 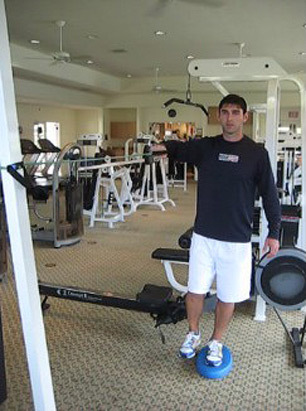 Rory Cordial, physical therapist and performance coach for American ATP professional tennis player Mardy Fish, incorporates these exercises to improve strength and power, while at the same time decreasing the chance for injuries. Cordial recommends using the Thera-Bands for your warm-up and integrating the rest of the exercises into your own workout routine. Place a miniband around your ankles and hold a piece of Thera-Band palms up. Keep the elbows in at the side while you externally rotate your arms creating tension through the Thera-Band (this will activate your rotator cuff; pull your shoulders back and down). Maintain this position with the Thera-Band while you step laterally with your feet facing straight ahead in an athletic posture (always maintain tension on the miniband by not letting your feet get closer than shoulder width apart). Perform two sets of 10-15 yards in both directions. Balance on one foot while standing on a foam pad. 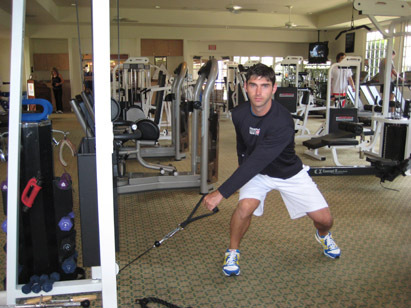 With the opposite arm, perform shoulder external rotation in the 90/90 position with a piece of tubing. Focus on stabilizing the moving shoulder with the scapular muscles and keep the abdominals engaged. Perform three sets of 15 reps.
Place one foot on top of a bench or physioball and the other foot forward in the split squat position. 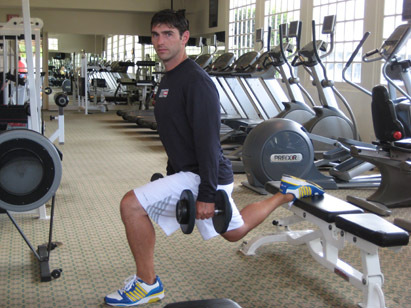 With bodyweight or dumbbells in hand squat down on one leg. The weight should be in the heel, shoulders back, chest up, and abdominals engaged. The key to this lift is to maintain perfect posture through the spine throughout the movement. Perform three sets of 10 reps each leg. Load the hip closest to the machine by squatting down in an athletic posture. Maintain perfect posture with the chest up and abdominals engaged. 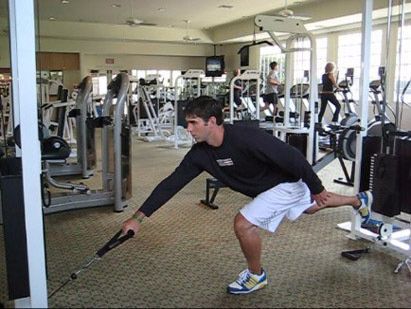 Allow your body to coil with your arm crossing over toward the machine. From this loaded position start the rotational movement by pushing through the ground with the foot closest to the machine. 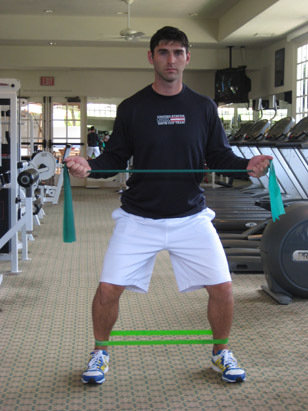 Continue to drive through that foot, hip, abdominals, and opposite shoulder as you transfer into the standing position. Perform three sets of 8 reps each direction. Stand in the split stance position with one foot on a bench. With the down leg push up onto your toe and squeeze your glutes. 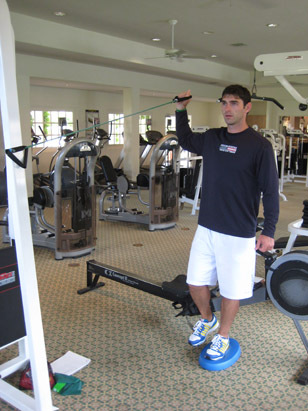 Maintain perfect posture with the head tall, shoulders back and down, and the abdominals engaged throughout the lift. In this position perform a dumbbell curl and then press the weight overhead. 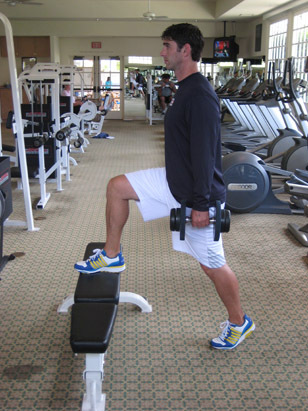 Perform three sets of 10 reps. Make sure to switch the lead leg every set. In the single leg squat position reach for the cable in front of you with the opposite hand as your other leg extends back behind you. Maintain perfect posture with your abdominals engaged and spine straight. 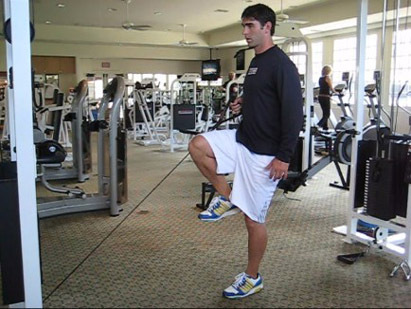 As you drive up from the single leg squat to a standing position, pull the cable to your side in a rowing motion with the shoulders back and down. At the same time the extended knee and hip will flex forward into the ending position. Perform two sets of 10 reps on each side.